There is a lot of information on the web about Jira REST API's and do some simple REST calls to Jira from Excel but I have been unable to find a good end to end resource that glues all the concepts together to show one how to login, retrieve data, parse the returned data and insert into excel. There are some 3rd party for purchase add-in's to excel out there but I wanted a general all purpose add-in for Jira integration with Excel that allowed me to get, update, create, and create word documents ie change request forms from Jira information without having to pay for something. In this article I will share my learnings, Excel VBA code, and references to others code that provides a fairly elogant tho still in progress semi generic integration between Jira, Excel, and Word. The first problem I wanted to solve while using Jira was that I wanted to see a list of issues, and their associated issues with the associated issues current status and fixed versions. I couldn't find away to do this in Jira so I decided to write an excel macro that would get issues from Jira and parse through the associated tickets and list out the status and fixed version so that in a single row/view I could see the status of the ticket and it's associated ticket. In the image below columns O, P, and Q show the results I was looking for. And if you look at CLOUD-8050 row you will see how when there are multiple issues linked to an issue how it's displayed in one cell. After solving that problem I kept extending the Excel macro functionality to create new tickets update tickets and fill in a word document with data from a jira ticket. The create and update features where more or less a one time need but the form project seemed like on an ongoing generic problem. While working on this project my biggest issue was that there were plenty of articles out there that talked to single point solutions in using the Jira Rest API from Excel but nothing that really provided an end to end view of how to login, call the api, parse the Json, and the nauances around what I learned. In this section I'll document how to use the excel workbook as an end user. In the points of interest section I'll document the learnings and key code fragments. Note: I have used data from https://jira.atlassian.com as examples. One interesting thing I have noticed is that the rest api call will sometimes fail but a subsequent call will work just fine. I have chaulked it up to load on the Jira server but have not introduced retry logic in that it has been easy enough just to hit the "Get Issues" button again and all works fine the 2nd time around. This is also where I had to introduce the No Auth code into the login process in that apparently the jira site does not require authentication nor will it take it on the Jira Rest API's. The excel work book that comes with this article contains the custom menu additions and the macros both those that I developed on others. When you open the workbook there is a new menu on the ribbon called JIRA. This is a custom menu that calls macros that perform various functions related to retrieving and working with Jira data. The predominate menus option is "Get Issues" this macro will in turn call Login if the user is not already logged into Jira through Excel. It will execut the Jira JQL command in column B1 and return the results starting in the table at A8 which is referred to by a defined name in excel as "StartRow". See the example of the excel workbook in the image above in the background section. On the macroValues worksheet there is a table that is used to define how to extract the returned data from Jira that is in JSON format so that it can be inserted into the excel worksheet. The the excel workbook sheet 'Tickets' row 5 which is hidden contains the key for each column. This key looks up the information int this table on the macroValues worksheet to determone how to extract the data from the Jira Json and if a method should be applied to the data to transform the data. You can add and remove columns to the Tickets worksheet simply by inserting a new column and indicating what key value is to be used to translate the data with. You can update the table in the macroValues with your Jira's instance specific custom fields and other fields that you may want to pull into excel by following the format in the table. Note that customfields will have different values even if you have the same name/label for that field. These values are unique to each Jira instance. When you make a change to the table you need to click on the Initialize button in the Ribbon Jira Group. This dynamically creates a macro called getValue and uses this table to create a sub routine that knows how to reference the desired data from the data returned by Jira. The login menu is available for those that may have multiple instances of Jira. IE. different jira servers that you use and want to retrieve data from. And it's only needed if you get data during the same session. For example if you open and close excel and then switch servers the 'Get Issues' command button will prompt you for login information and let you switch servers. The 'Update Linked Status' command button is only used if all you want to do is update the status of the linked issues that are already in the 'Tickets' worksheet. When you use the 'Get Tickets' command button it gets the Jira tickest and updates the linked status all at once. The 'Fill Out Word Template' command button prompts for a word template and a Jira ticket key. The drop down box for the word templates is populated form the table on the macroValues worksheet just add the full path to any word document that you want to use as a template. 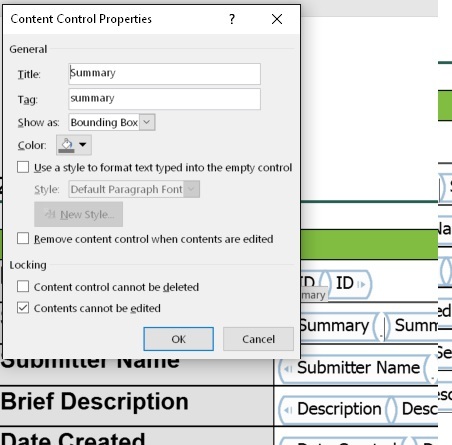 The command loads the word document loops through all of the custom form fields in the word document and matches the tag on each form field to the same table described above in the key column. When there is a match the approriate Jira data is inserted into the form field. 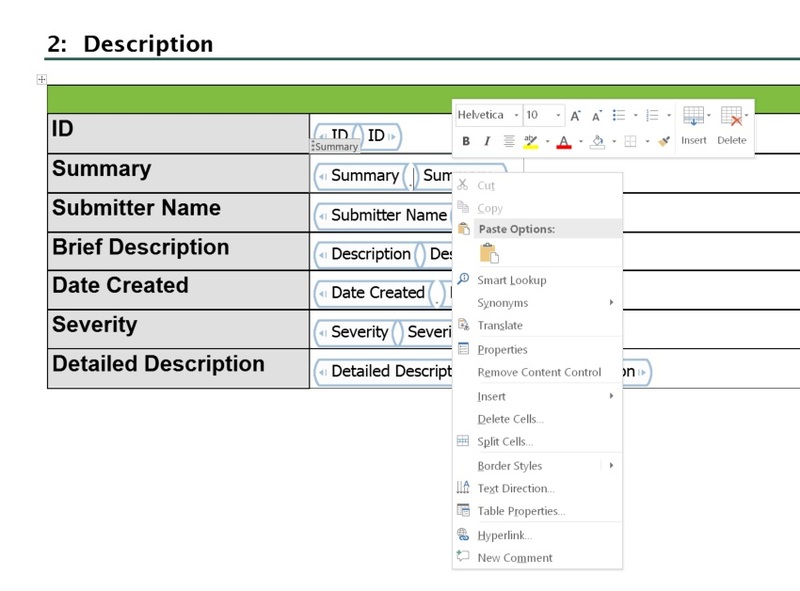 The following excerpt from a word document show where the form fields are in the 2nd column of a table. To insert word customer form fields into a word document you must enable the developer tab on word. The image below show where the developer tab in word has been enabled. To insert fields select the 'Design Mode' command mode and it will highlight itself in grey to indicate that you are in words design mode. Once in design mode you can insert a text box or check box where Jira data can be inserted by the macro. After you have inserted a form field you can right click on it and select the properties menu option. In the properties dialog box for the form field just inserted edit the tag field and insert the name of the key from the Jira table on the macroValues worksheet to indicate what data you want inserted into this form field. It's also a good idea to put a check mark on the 'Contents cannot be edited' field so that users don't edit the word document thinking that they can make changes to Jira when a change is made to the word document. A future version or seperate project might be to create code that would allow Jira data to be updated in the word document and then updated in Jira. While this is technically possible the work flow and potential hazards of doing so would need to be well thought. For example what if the data had changed since it was inserted into the word document. Would the end user have access to Jira. Typically this functionality if for the purpose of getting a static copy of the Jira data and getting a physical signature from a client or stake holder. Repeat the process for as many Jira fields that you want inserted into your word template. Once you have your word template in place it's simply a matter of select the command button from the JIRA custom menu and filling out the dialog box. A new instance of word will be opened, the templated loaded, the data fetched from Jira and then inserted into the word document. The create and update menu options where one time use deals for me. They are hard coded to the values used for creating and updating tickets but can serve as a decent reference for using the Jira API's but there is nothing fancy and nothing that a number of other articles haven't touched on. I found the use of the chrome addin postman very valuable in that I could make sure that the basic format and structure of the rest uri was correct and test it in postman. It was also very useful to be able to see the returned Json so that I could identify the hierarchy structure to know how to access the converted Json object structure. 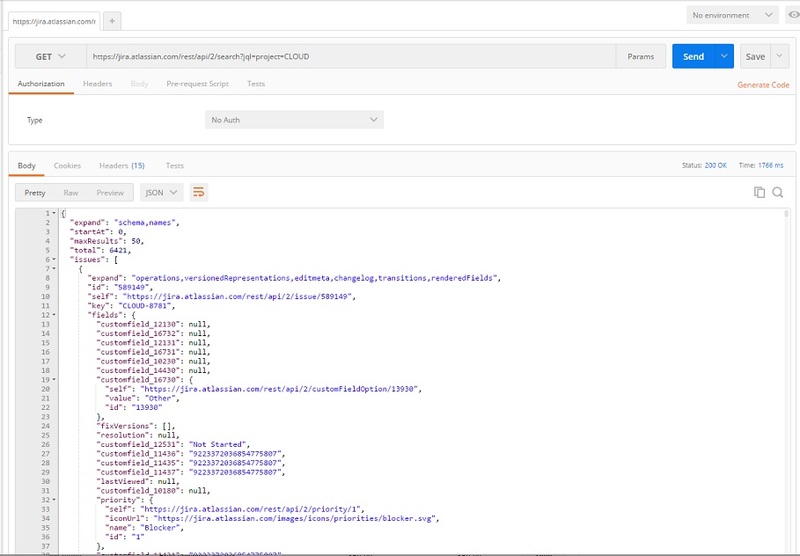 By sending the rest api string to Jira through postman I can see the raw json returned. This was the best way to determine what custom fields are labeled with so that you can dereference the returned Json accurately. You might have to update an existing ticket with some unique identify values so that you can pick out the field in the returned Json. Save the username and server URL for the login dialog box uses WriteProp and ReadProp methods that I picked up from the following location. I found this tool at http://openxmldeveloper.org/blog/b/openxmldeveloper/archive/2009/08/07/7293.aspx and utilized it to easily customize the Excel Ribbon Menu. To add my own menu to an excel document I used the UI editor tool to edit and update the excel file so that the JIRA ribbon menu is available when opening the excel file. There are several methods in the VBA project that start with useful stuff. Check the following website for details and information on useful stuff. I copied the fromISODateTime function and created fromISODateTimeNoZ which simply removed the 'Z' from the regular expression in order to parse the dates returned from Jira which were in iso format minus the Z at the end. At one point I was attempting to use the cJobject provided with mcpher's code however the VBA-JSON project mentioned below was what I ended up using. There looks like there is alot of cool stuff at ramblings.mcpher.com and worth reading up on. I imported quite a bit of his code but ended up not use much of it. Regardless I think there is some really cool concepts and stuff there that merits further investigation. This tool was relatively easy to use but I didn't find much documentation on it's actual usage and had to learn alot through trail and error. The biggest issue I had was deteremining if a value existed something along the lines of IsNULL. Here the Json string returned from Jira is parsed into an object called JsonObject after it is parsed into an object you can reference the Json as an array of arrays type object. From the image above of the Json returned in chrome's postman the following references can be made. There are numerous examples on the internet for logging in to Jira. To round out the examples I have added in a couple of features. Credentials are stored in a global variable called usernamep if that value is not blank "" then when a call is made to login that value is returend with the previously provided credentials. Otherwise a dialog box is shown. If the No Auth check box is marked then usernamep is set to "NoAuth". The function GetIssues is provided to show how the login information is used. It's pretty basic when you put it together. As you can see if it's NoAuth the header is set to "Authorization","No Auth" otherwise you set the header to basic and use the encoded username password. Using the usernamep for two purposes is bad programming practice and ideally the authorization value should be a seperate variable all together. A future version of the code will likely support this so that additional authorization methods can be supported. The only real unique aspect about this method is the s = GetUrl line. We could further abstract this method so that the actual Rest API is passed in so that queries that return multiple issues or single issues could be made in the same method and all the surrounding logic reused. Note: it's amazing how much refactoring and improvemens you find in your own code when you start to write about it. The more interesting method here is once the Json is returned from Jira the code loops through the rows in the returned Json and the columns in the worksheet. Using column headers to pull out what data is to be displayed. The getValue function is dynamically created from the table on the macroValues worksheet. From columns D through G. This allows for the addition of being able to extract data from the Json based on custom field values for each Jira instance that this code may be used against, in that custom field values are unique to a Jira instance. The CreateCaseSub function creates a new function and dynamically adds it to the excel vba project utilizing the VBProject object references. The function to create the function has the basic form of creating one long string then calling the appropriate method to insert the string as code. The following code is an example of getValue. Where for each key in the table the object is checked for a null reference and returns either "" for null or the actualy object data. At first I used the iif function but it like many trinary operators actually parses the false expression and throws an error if the object can not be referenced thus the more verbose if then else clause had to be used. The following code does the parsing. After having prompted for the template and key, retrieving the Json and converting it to an object this code loops through the word form fields. s.status.Caption = "Opening Microsoft Word"
oCC.SetPlaceholderText , , strText ' if placeholder text exist this removes it so that a clean document without unwanted texted is provided. s.status.Caption = "Finished updating " & i & " fields in template." The following is a snippet of the Json that is returned from Jira notice how there is a bracket [ after the field name. This indicate an array in Json. Here I have decided to just grab the first array value. One could write a special method to extract all values from this field similar to GetFieldsWithCount. However, in this instance I know that there will only ever be one value. It's likely how the custom field was created with in Jira that causes this and likely a mistake in this case. But it serves as a good reference and tip on how you can extract the Json. It's pretty cool that you can create custom menus for each excel file. Note this is not an add in of a permante nature. The menu only appears when you have the associated excel file open and it has the focus. To use the Custom UI Editor for Microsoft Office you simple open the excel file in the tool, note: the excel file cannot be open in excel, create the XML and save the file. If there are errors in your XML the menu simple will not appear no error messages are displayed. For this reason adding elements on at a time is recommended. Instead of trying to create custom icon's for my custom menu I picked from the stock set of office icon's. I utilized the reference at the following link to browse through the available icons. One of the more annoying learnings I discovered is that the UI editor appears to load the excel macros in addition to the menus into it's memory. So if you open the UI editor open an excel file and udpate the xml then save it, but keep the excel file open in the UI editor, any chances you make to your macros in excel are overwritten if you come back to the UI editor and make changes and save again. So the learing open the excel file in the UI editor make your changes then close the file then open in excel. At first I utilized the excel status bar in the lower left hand corner and updated the excel cursor to a xlWait but realized that the status bar was kind of out of the way and not as noticeable. So I popuped up a dialog box with a status label to provide feed back to the user as to the progress. This seemed to be more user friendly and user informative. I also decided not to change the cursor in that the dialog blocked the user from doing anything until the macro was finished and provide the visual feedback needed. I have found that when you try and update the cursor manually there are almost always unforseen scenarios that leave the cursor in an inaccurate state. It took quite a bit of playing around with vbCrLf and commas before and after strings to line up the Linked Status and Linked Fixed Versions to align with in the cell to the associated linked tickets. There is likely a better way to handle this but for now the brute force method of string manipulation worked. Thanks Brad, i just started learneing VBA and this was the right level. Important: the field is now called fixVersions and not fixversions (V uppercase!). You need to add a clooumn in the sheet "Tickets" called "mother" (in hidden line 5). So hope this helps others a little bit. Hi. Has anyone run into compatibility issues running on win10 x64? Thanks Brad, great work. But, I had to make change for Login to work. The work here is excellent and very appreciated. I had two problems, which took me a while to resolve because I'm new to API and not so good with VBA. I'm not savy enough to know if what I did applies to all users. If it does, please update the sample code. 1) The 'Login' sub function messed up the authentication. Clicking on Login caused usernamep to have an invalid value (the raw user name and password) and then in future calls to UserPassBass64 that value prevented it from updating with the base64 value. I simply changed the code in the Sub Login. 2) In the GetIssues function. JiraService3 MSXML2.XMLHTTP60 did not work. I found that MSXML2.ServerXMLHTTP worked. This is great. Thanks Brad! Has anyone gotten the fixVersion names to be displayed in the Excel worksheet? I've been able to successfully add many other custom fileds and still haven't been able to figure out why the fixVersions aren't being pulled. Does anyone have the create ticket function working? And if so, what did you change within the code to make it work? Yeah I had the same problem. Was getting "Project is required" error. The solution for me was to specify the project not as the full name no the project ID but use the Project "short name" or Key which in my case was a four letter acronym for the project name. Once I used that value on the Create sheet and specified correct values for columns A through H, it worked fine! You don't need to fill out columns I, J, K, L or M as they are used for debug info. Are you able to edit labels and fields with this? This is great and I agree that there is not much of a concise and comprehensive explanation on any of the Jira Rest items and integration. I was wondering if the update tab is used for updating specific issues and their labels. If so how is this done? Also for those who have a different version of excel you may need to update your library references. For me I had to go into Developer then Visual Basic and go to Tools/References and change the library from Microsoft Word 16.0 to Microsoft Word 15.0 which is my version. Many thanks for this, its a great solution that took me quite a while to find. If you cannot bypass the Jira restriction, you will have to perform the search in batches of 1K using the "Start At" value to step through and then combining the multiple results into a single file. Thanks so much for the macro, I find it very helpful for one of my task at work. I'm about to add one more field for Story Points but it hasn't worked yet. 3. I clicked on Initialize and also button "Create getValue Macro from Table"
and compiled the project but it didn't pull story points for the issues retrieved. So could you please point out how I could resolve this? I ran into problems with updates to the getValue function also. It turns out that the Module1 cannot be deleted and created unless you enable Trust access to the VBA project object model (Excel 2013 and up). 2 - Select Options from left hand column and Excel Options window pops-up. 3 - Select Trust Center in left column, then click Trust Center Settings... button and Trust Center window pops-up. 5 - click the check box for Trust access to the VBA project object model. Now you should be able to click initialize or the Create getValue Macros from Table button on the Macro Values sheet to update the getValue function. Did you get some feeback ? I'm in the same situation than you and i'm interrested if you have the answer. Am very impressed with the code above. we are using effectively. Could anyone help in retrieving comments for an issue? Tried with few possibilities was unable to get. Unable to find the field name related to comments with an issue. It works fine except few fields throwing Type Mismatch. Example - Severity field is not being pulled correctly and it is showing Type Mismatch error. When I click on the Create Ticket link. Nothing is happening. This is because in CreateTickets function..
the value is EMPTY. How to overcome this error.. Any idea? I am getting the message below on Get Issues - I have the feeling I've missed something fundamental?! I am also facing the same issue. Any clue about this. The text shown is usually the beginning of a 401 or 404 error. I usually means either the url is wrong and/or the login authentication is bad. The old code for UserPassBase64 assigns <user>:<password> to variable usernamep inside the function to call the xml Base64 converter but never reassigned the Base64 value to the variable usernamep . This caused the Authentication to be saved as user:password in clear text and not in Base64. So when UserPassBase64 was called again it just returned the last value of the variable usernamep.